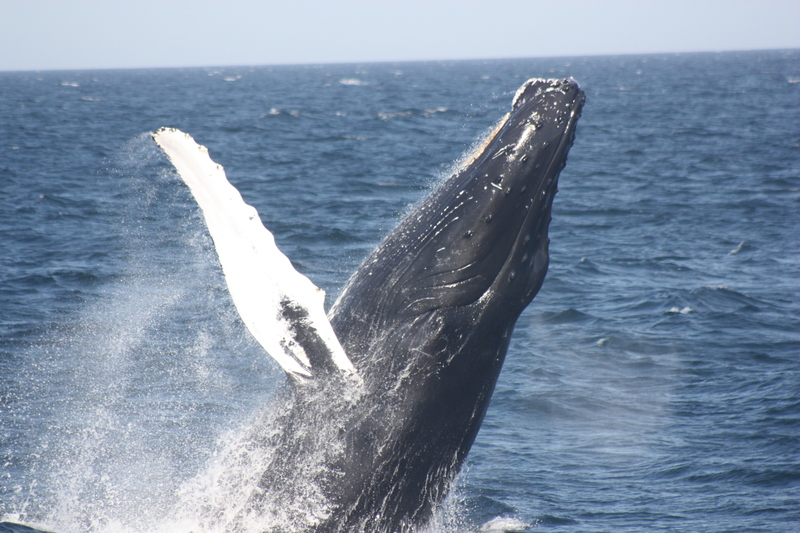 Whale Talk/Reports | We will be talking about whale sightings and anything to do with whales, dolphins and sea birds. 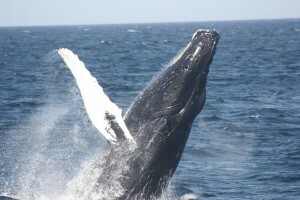 We will be talking about whale sightings and anything to do with whales, dolphins and sea birds. What a very special day!!! It’s been a month since I have been on the water. When I did the dock talk, I thought we were going North, like we had every day the past few weeks I thought. Nope, we were headed South to Stellwagen to see a few humpbacks. We watched Owl and Lace for a few surfacings. HUGE whales–especially Lace. She has to be pregnant! Then eagle eye Nancy found a big splash in the distance, so we went over to it. Guess who? NILE!!!! She continued to breach and flipper slap for a half hour. What a treat to get to see Nile today!!!! For those who don’t know, I am starting a new business doing school presentations. I had an inflatable life-size model of a humpback whale made that I am taking into schools to share with students. The whale I had made is Nile!!! Today was a great day!!! Check it out at www.thewhalemobile.com. Till next time…..
What a gorgeous day out on the water!!! It was flat calm all day, and there were so many whales around! We saw blows in every direction. In the morning, the whales were feeding using bubble clouds, but because the bait was deep in the water, we didn’t see any mouths open at the surface. We did get lucky and see a little bit of that in the afternoon. Columbia and Geometry were doing some surface feeding, and we saw their heads high out of the water filtering all the fish. We still aren’t sure what they are feeding on. It doesn’t seem to be the typical sand eels. The bait looks different on the fish finder, and the whales are feeding in a different way. Some of the whales we saw today are Chromosome, Columbia, Orbit, Freckles, Draco, Geometry, Sloop and calf, Scylla and calf, Longboard, Shuffleboard, and Hornbill. Can’t wait until tomorrow! 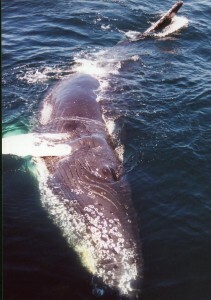 One of my favorite whales!! She showed up last week. She was here for a day or two, then headed somewhere, to return later in the week. She has been seen lunge feeding. Every time I was on the boat, she was elsewhere, so on Sunday, I woke the kids up to take them on the boat to see Nile. Nile is the whale that I used to design my inflatable whale that I take into schools. What a treat to see her finally this year! Even my 6 year old daughter recognized her dorsal fin (having seen the inflatable whale often this spring)! I hope to see her this afternoon also! What a gorgeous day!!! 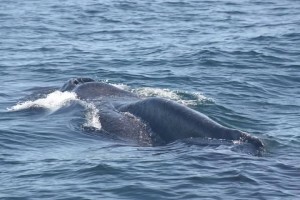 It was flat calm, lots of blows, and great looks at a mother and calf. Sloop (one of my favorite flukes) and her calf were there. We started watching the calf flipper slapping by itself. We knew mom was probably close by, but it took over ten minutes to figure out who the mom was. 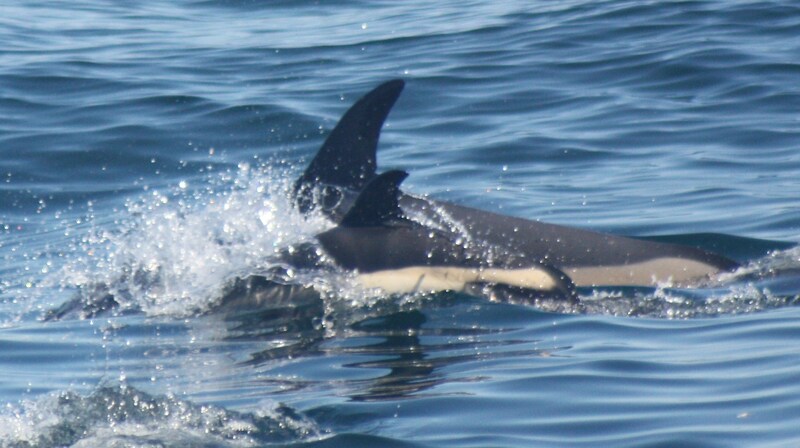 Once the mom came back to retrieve the calf, nursing commenced. 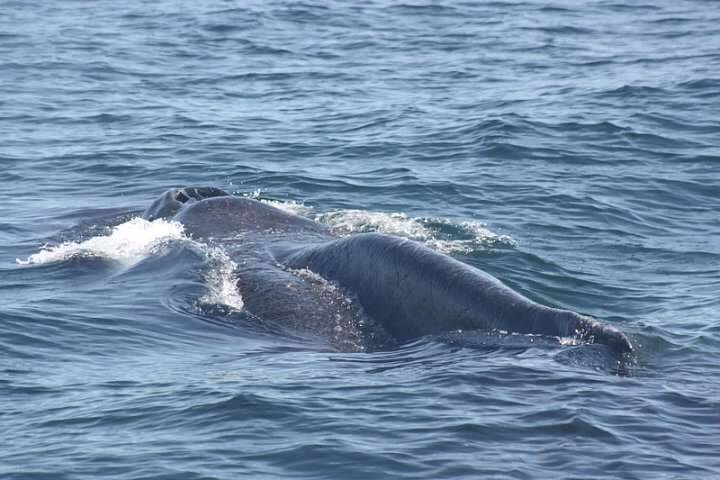 It was so clear that we could vaguely see the calf hanging below the mom as it nursed. On the next surfacing, mom was just hanging at the surface, bringing her head up. The calf was probably ten feet beneath her for about five minutes. It was magical! Can’t wait for the afternoon!!! 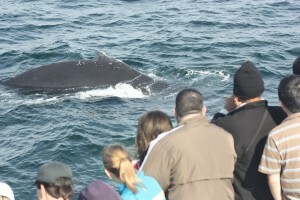 Finally, another whale that we normally see, but hadn’t this year, showed up! We saw Etch over the weekend. Always a popular whale because of the feeding style–3 slaps of its large tail no the surface. Oddly enough, yesterday we saw Etch-a-Sketch feeding using bubble clouds. Whales will blow a large blast of bubbles deep in the water and when the bubbles rise, the fish are trapped inside. It makes life easier for the whales to feed–using tools. 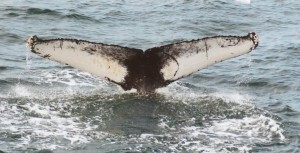 Usually, when a whale uses one method of feeding, they stick to that method. Traditionally, Etch has been a kick feeder. This is when a whale dives deep in the water blowing a ring of bubbles, comes up to the surface, kicks its tail a couple times, then goes down for a mouth full of fish. Click here to learn more about research the Stellwagen Bank National Marine Sanctuary is doing on feeding strategies. Only time will tell if the whale is changing feeding strategies or perhaps this was just a blip. She’s finally back! We saw Cajun for the first time this season over the weekend. It was such a welcome sighting! She is 14 years old this year and I remember seeing her for the first time as a calf. In 1998 I painted the whale on the dock. The original whale tail I painted was Cascade (looks like a cascading waterfall). About two days after I painted the whale, we saw her and her newborn calf (who would be named Cajun). Cajun has always had a special place in my heart over the years. She loved to play with the boat, coming along side and looking at us. Judith Scott took this picture years ago of Cajun looking at us! We saw Cajun yesterday as well feeding on Stellwagen Bank. We look forward to many more sightings of her this year!!! What a beautiful day out there today. With the whales finally near the northwest corner of Stellwagen Bank, our trips are much shorter because we don’t have to travel quite as far. Today we were treated to a nursery pod of dolphins. There were calves that were probably weeks old judging by their size. Of course I tried to get a cute picture with their heads out of the water, but no luck, just the back ends. Nice nonetheless. We left the dolphins and saw two mother calf humpback pairs. 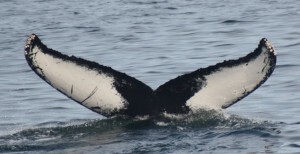 The first was most likely Rapier, born in 1989 to a whale named Ase. (We never saw the fluke.) This is Rapier’s 6th calf. They were quietly traveling under the surface of the water. The calf came over quite close though to check us out a little bit before heading on their way. Next we looked at Tulip and calf–her 7th calf. 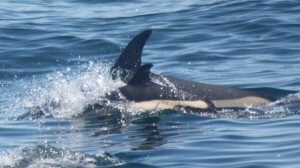 Tulip herself was first sighted in 1988 so is at least 25 years old. Unfortunately, Tulip has looked sick since the beginning of the season. No one is sure what is going on with her, but she is very thin–probably thousands of pounds less than other whales her size. She doesn’t appear to be entangled in gear, which can often cause illness. It’s possible she has cancer, she could have an obstruction, something plastic in her belly? At this point we are just grabbing at straws to explain her appearance. If we learn any more we will keep you updated!! The last few days have been great conditions for finding whales. 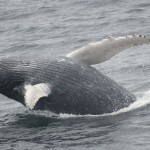 Flat seas and great visibility has revealed that the whales are still feeding on Stellwagen Bank. We spent most of today’s trip on this season’s most familiar cow/calf pair; Boomerang and her very active calf. Nearly every time this calf goes on a dive it lifts its fluke high into the air which is not common for calves this time of season. The calf also threw us off guard today when it split from it’s mother and went off on its own for a few minutes before racing back over to her. We ended our trip on a pair of fin whales that were swimming amongst a pod of Atlantic White sided Dolphins. I’m always so curious to see how different whales interact with each other but when you get two different species interacting, it is really fascinating. It is still a mystery as to why they do this. What is even more curious is that this is the second day in a row we have seen this type of interspecies interaction, and yesterday they were probably about 15 miles north of where they were spotted today! A lot more feeding behaviors on Stellwagen today. There were whales doing different behaviors in every direction. 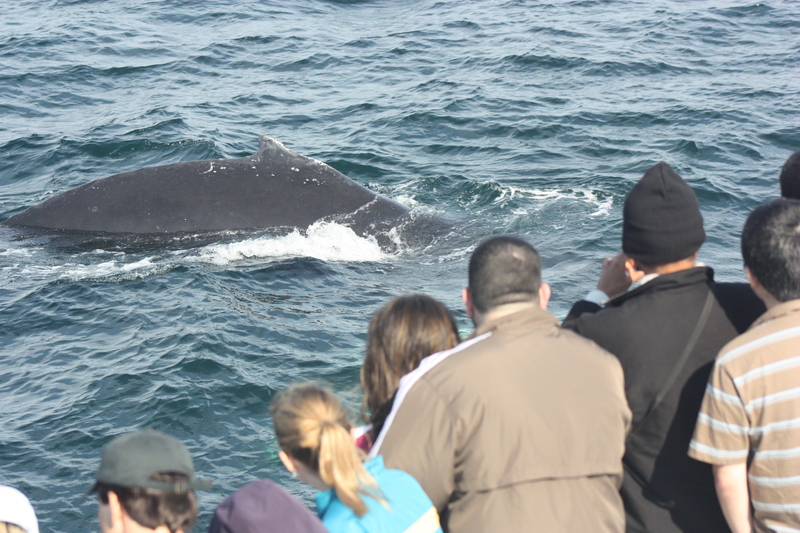 Some highlights were when we had a very active calf played with the boat while mom was feeding and when a humpback named Putter swam right underneath the boat then proceeded to lobtail for the rest of the trip. 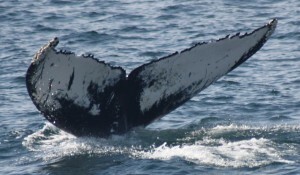 admin on Cape Ann Whale Watch welcomes you to our new blog page. Please check back often.